The 2015 NCAA Outdoor Track and Field Championships start on Wednesday in Eugene, Oregon, with the men’s competition taking place on Wednesday and Friday and the women’s on Thursday and Saturday. We break down the women’s mid-distance action for you below. 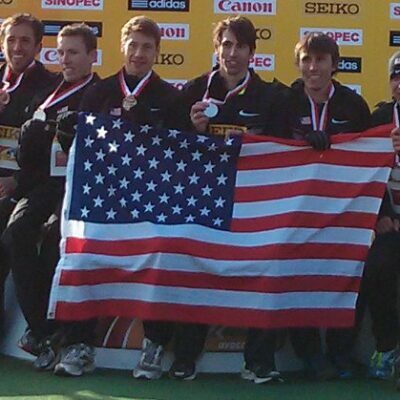 Other previews: Men’s Long distance. Were it not for Leah O’Connor, Shelby Houlihan would be on the verge of closing out a ridiculous stretch of 1500/mile running. Houlihan won NCAAs in the 1500 last year in dominant fashion and broke the old meet record this year at NCAAs in the indoor mile, running 4:28.71. Unfortunately for Houlihan, she ran into a buzzsaw in O’Connor, who ran 4:27.18 from the front to win and become the second-fastest woman in NCAA history. 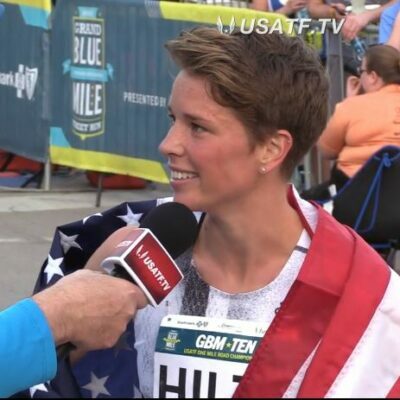 Houlihan can still make some history of her own O’Connor is only running the steeplechase at NCAA outdoors, which opens the door for Houlihan to join Wisconsin’s Suzy Favor-Hamilton (1987-90) and Mississippi State’s Tiffany McWilliams (2003-04) as the only women to win back-to-back 1500 titles. There’s a lot to like about Houlihan’s chances. She has the second-fastest PR in the field and has also run 2:01.12 for 800 meters, finishing 7th at USAs last year. Her range goes both ways, though, as she’s won the past two Pac-12 5,000s, last year defeating eventual NCAA runner-up Aisling Cuffe and this year winning handily by eight seconds in 15:58. She’s lost to a collegian in just two races all year — the NCAA indoor mile, to O’Connor, and the NCAA indoor 3,000 just a few hours later, where she was eighth. 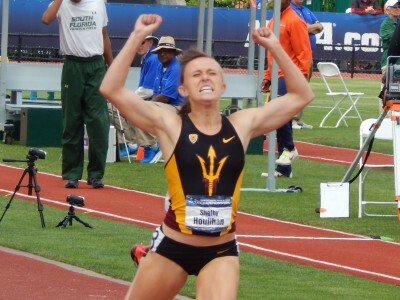 Houlihan’s strength, speed and championships experience make her the favorite in Eugene. The woman most likely to upset Houlihan is this year’s NCAA leader, Rhianwedd Price of Mississippi State and Wales. Price initially made it through to the NCAA mile final indoors but was DQ’ed; she’s taken vengeance outdoors, running an almost-five-second PR of 4:11.67 at the Florida Relays on April 3 and bettering that two weeks ago at regionals (4:10.95) to become the only woman on the year to break 4:11. Price hasn’t been quite as dominant as Houlihan. She didn’t win her conference meet, losing to Arkansas’ Dominique Scott by over three seconds. Scott is a fine runner in her own right, but she’s more of a 5k type; if Scott can drop her, it doesn’t bode well for Price’s chances against Houlihan. With her PR at regionals, Price is peaking at the right time, but she needs to prove she can deliver on the big stage. No one else in the field has broken 4:12 on the year (O’Connor and Florida State’s Colleen Quigley have both run 4:11 but are only running the steeple at NCAAs), but a few other women could threaten Houlihan on the right day. Iona’s Rosie Clarke was fourth at NCAA indoors and is the third-fastest woman in the field by season best. There are also a pair of high-upside women who have yet to live up to their potential outdoors. The first is 24-year-old Lithuanian Natalja Piliusina of Oklahoma State. The 2013 NCAA champion, Piliusina has the best pb in the field (4:09.51), but that time is from three years ago. Though she has run 2:01.93 for 800 this year and won Big 12s in the 1500, her season best in the 1500 is just 4:17.69. The good news for her is that she ran that time to win her heat at regionals, so she’s in good form heading into NCAAs. If you want to impress your friends, picking her as an upset winner is a good way to go. The other high-upside entrant is Stanford’s Elise Cranny, who was fourth at World Juniors last year and the runner-up in the 3,000 at NCAA indoors (she also anchored Stanford to a runner-up finish in the DMR). The 2015 outdoor season has not gone as smoothly for the 19-year-old. Last year, as a high school senior, she ran 4:10.95 at Payton Jordan; a year later, she could only manage 4:16.22. Cranny was fourth at Pac-12s (three seconds back of Houlihan) and was the final qualifier in her heat at regionals. This season is nothing to worry about as far as Cranny’s long-term development is concerned (she still ran 4:14.05 at Pac-12s so isn’t that much slower than last year) but it’s not quite the wild success she enjoyed during the cross country and indoor seasons. Cranny should win an NCAA title some day, but it probably won’t come this weekend. Who will win the women's 1500 at 2015 NCAAs? 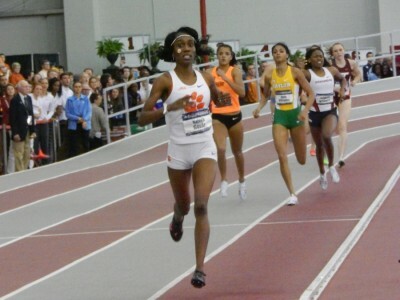 Some doubts surrounded Clemson’s Natoya Goule ahead of the NCAA indoor championships in March. Though she had the nation’s fastest time, the sub-2:00 performer hadn’t been quite as dominant as expected and was upset at ACCs. Then Goule came into NCAAs and crushed the competition, running a meet-record 2:01.64 after going out in an absurd 56.63 seconds for the first 400. Outdoors, there’s no doubt about who the favorite is at NCAAs; Goule has the fastest time in the country at 2:01.32, run at ACCs on May 16, and she hasn’t lost an 800 to a collegiate runner since that loss at ACCs indoors. Chrishuna Williams, senior, Arkansas (2:01.61). The good news: Williams was the second-fastest woman in the NCAA this year, running 2:01.61 to win the fast heat at Payton Jordan and beat a stacked field that included Piliusina, Claudia Saunders, Olicia Williams and Hanna Green. The bad news? Williams was only second in her conference meet, falling to Ole Miss freshman Brooke Feldmeier (whose PR at the time was only 2:03.86). Feldmeier is a talented runner, so losing to her is no shame, but if Williams runs like she did at SECs, she won’t have a shot at NCAAs. If she can recapture her Payton Jordan form, she has a shot to upset Goule. Raevyn Rogers, freshman, Oregon (2:01.67). As we mentioned after she won Pac-12s, Rogers now seems to be unlocking some of her tremendous potential. Rogers, who was an age-group star and third at World Youths in 2013, dropped her PR from 2:03.32 to 2:01.67 in that race and led all qualifiers with her 2:02.50 at regionals. 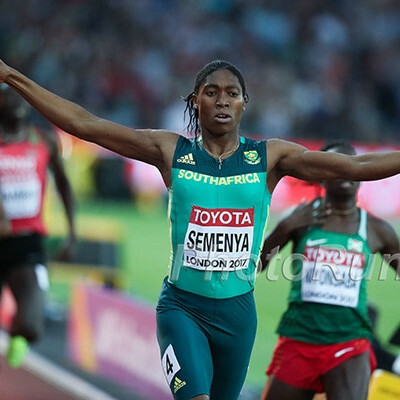 Still only 18, she still has room for improvement and her performance will be key in what should be an extremely tight women’s team battle (Track & Field News has the top seven schools separated by just eight points). She’ll have the support of the Oregon faithful which could be key. 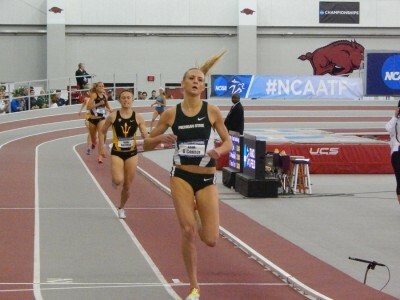 Hanna Green, sophomore, Virginia Tech (2:01.72). Green is one of only two collegians to beat Goule over the past three years, taking her down at ACCs indoors (LSU’s Charlene Lipsey, since graduated, also beat her at SECs indoors in 2013). Green couldn’t take her down at ACCs outdoors, but gave Goule all she could handle, running 2:01.72 to Goule’s 2:01.32. 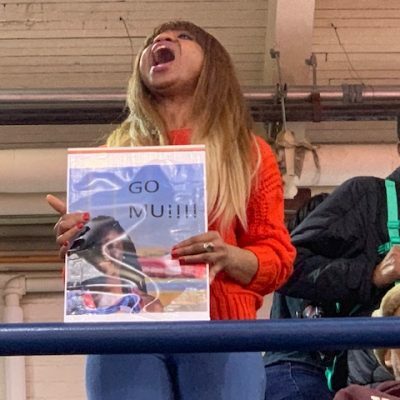 Green was only fifth at NCAA indoors and lost to Claudia Williams, Olicia Williams and Saunders at Payton Jordan, so she’s going to need to bring her A game and hope Goule doesn’t in order to win. Claudia Saunders, junior, Stanford (2:01.79). The top returner from last year (2nd), Saunders has run almost a second faster in 2015, but repeating her runner-up performance will be difficult. She was only fourth at Pac-12s, behind Rogers, Oregon’s Annie Leblanc and teammate Olivia Baker, all of whom will be in the 800 in Eugene. A win will be tough. Also keep an eye on indoor runner-up Kaela Edwards (though she was only third at Big 12s) and Leblanc. Leblanc hasn’t run particularly fast this year compared to the top contenders (her 2:03.77 puts her 14th on the NCAA list) but she has put together some impressive accomplishments this year, defeating pros Mary Cain (at 1500) and Treniere Moser (at 800) on consecutive days at April’s Oregon Relays and outdueling Goule on the anchor leg of the sprint medley relay at Penn. Leblanc, who was a solid second at Pac-12s behind her teammate Rogers, rises to the competition and the competition doesn’t get much better than NCAAs. 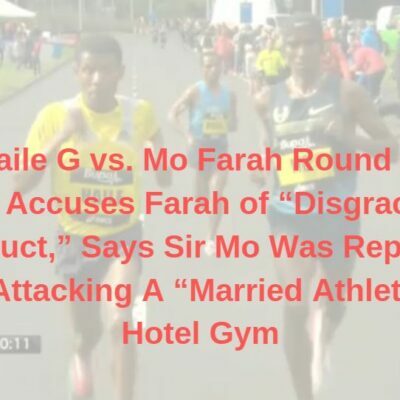 This race will be a key battleground in the women’s team competition. Track & Field News has seven women’s teams within eight points of each other at the top, and of those squads, Oregon (Rogers and Leblanc), Arkansas (Williams) and Florida (Claudia Francis) all have potential scorers in the 800. T&F News‘ projections has Rogers finishing fourth and Williams sixth. Bump Rogers up two spots, and the Ducks go from second to first; bump her down two spots and their tied for fourth. Every point is valuable at NCAAs, and given the unpredictability of the women’s 800, it could be a major factor in determining who lifts the team trophy on Saturday. Who will win the women's 800 at 2015 NCAAs? Women’s 3,000 Steeplechase (prelims Thursday, 7:38 p.m. ET; final Saturday, 5:25 p.m. ET): Leah O’Connor Looks To Be First Person To Repeat Since 2009 – Can She Get The Collegiate Record? That’s right. O’Connor ran faster than she did in 2014 yet moved down two spots on the all-time list. The women’s steeple was contested for the first time at NCAAs in 2001, so it’s still a relatively new event, but it bodes well for Frerichs, Quigley and O’Connor that the two women above them on this list are among the U.S.’s best medal threats at this summer’s World Championships. O’Connor is the defending champ (a race she won by over seven seconds) and hasn’t lost a race on the track all year. She has yet to go all-out in a steeple, but she should be able to get into the 9:20s with a good run at NCAAs. She ran 9:41 at the Virginia Challenge on April 17 to qualify for regionals, winning that race by 20 seconds, and then ran 9:51 at Big 10s to win by 23 seconds. At regionals, she ran 9:35 and won her heat by 17 seconds. 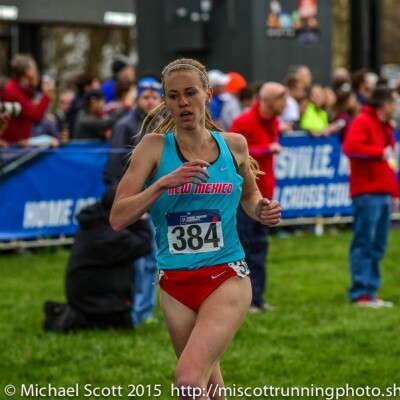 With Frerichs and Quigley pushing her at NCAAs, she’s likely to drop her time even further. It would be a surprise if O’Connor lost at NCAAs, but it was also a surprise when she took down 2012 Olympian Shalaya Kipp to win the title last year. Frerichs and Quigley both have better PRs, and Quigley has very good mile speed (4:29.67), though O’Connor’s is obviously better (she beat Quigley by over four seconds in the mile at NCAA indoors). Frerichs doesn’t have the speed (4:22.59 1500 pb) but she did beat Quigley head-to-head in the steeple at Payton Jordan. Still, before NCAAs last year, we cautioned that Kipp might be vulnerable as her PRs weren’t that much better than the rest of the field. We can’t do the same with O’Connor as she’s the second-fastest miler in collegiate history and her win at NCAA indoors was one of, if not the most impressive collegiate race of the entire year. Most other years, Quigley or Frerichs would be favored to win, and both will get another shot in 2016. But this has been the year of O’Connor. Expect that to continue in Eugene. 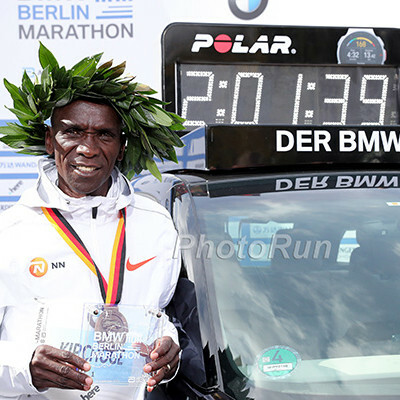 One other thing to remember about the steeple: because leading can actually be an advantage (giving runners a clean run-up to each barrier), championship races can often go very fast, leading to large PRs. In fact, Simpson’s collegiate record of 9:25.54 was set at NCAAs in 2009. Last year the top three of O’Connor (8 seconds), Boise State’s Marisa Howard (15 seconds) and Baylor’s Rachel Johnson (5 seconds) all knocked substantial time off their personal bests; Howard and Johnson will have to do so again to contend at NCAAs (neither has PR’d in 2015). One athlete who could knock a chunk off her pb is Colorado freshman Erin Clark, who has access to the country’s top women’s steeple coach in Mark Wetmore. Clark won her first three steeples of the year, setting a PR in each (including a seven-second win at Pac-12s) and dipped under 10:00 for the first time at regionals, running 9:59.67. Howard entered NCAAs with a 10:00.79 pb last year and walked away with the runner-up trophy; that kind of progression is unlikely for Clark given the quality up front, but chances are that she — or someone else in the field — is going to enjoy a big breakthrough and upset the form charts to nab a spot in the top five. Who will win the women's steeple at 2015 NCAAs?